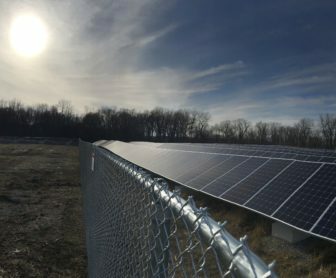 Sun coming down onto the first row of panels in the solar park. Lansing Mayor Andy Schor proposed a plan March 25 to use 100 percent renewable energy for all city government buildings. This would make Lansing the first city in Michigan to do so. Part of his budget proposal included a plan to buy renewable energy credits from the Lansing Board of Water and Light. The plan, as proposed, would take effect July 1 and would power all 187 city buildings. Director of Parks and Recreation Brett Kaschinske said that department was proud of the suggested plan. Schor said the plan won’t impact residents’ bills. Schor explained that, in addition to the renewable energy plan, the proposed budget would hire a new police office and fix roads and sidewalks, among other things. The switch to renewable energy works through the board’s Greenwise plan that Lansing BWL already has in place and allows residents to choose to use renewable energy at a slightly higher price. The expected cost to upgrade to cleaner energy is expected to be around $280,000 per year, with the rate falling about $10,000 every year. Since climate change is a global problem and cannot be solved by a single continent, much less a single city, motivating factors were cleaner air and setting a precedent for other cities. Lansing BWL plans to use mostly wind power, though it is exploring solar and hydro options as well. The details aren’t finalized, but BWL is working out ways to maximize the renewable energy it can offer. Customer service representative Jack Lovin said the plan would be sure to happen by the mayor’s July 1 promise. The plan depends upon approval of the budget by city council, which is mandated to occur before May 20. The budget can be viewed on the city’s website. Matt Martin presented ideas about a safer parking plan near his business. 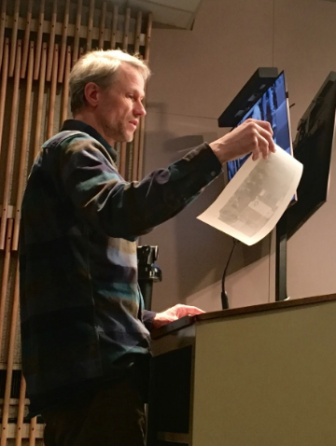 During the public comment portion of the meeting, people spoke about pollution and the Red Cedar River and parking. Ronald Horton said he came across raw sewage while walking along the Red Cedar River with his wife and said releases of sewage are commonly found in the Grand River, as well. “State regulators in Lansing have said that the sewer systems and drain-off is a major problem,” said Horton. He explained how the Red Cedar River flows into a wetland, which acts as a sponge, to soak up the raw sewage. Horton also mentioned the Department of Environmental Quality noticing an increase in E.coli levels surrounding the wetland as a possible result of this. Matt Martin, owner of Ahptic Productions, also spoke about parking near his business. Martin brought photos and handouts to visualize the safety concerns of parking on Cleveland Street. He mentioned his employees having to back out into a four-lane road and stacking cars on a hill, increasing their exposure to oncoming traffic. His proposal is to pave parking farther down the road for his employees to safely park. Junior Journalism major from Boyne City, Michigan.